Ender was part of the Dansby Swanson trade that took place at the beginning of the 2016 season. It almost seems as he was just "thrown" into the deal to make things even between the clubs. 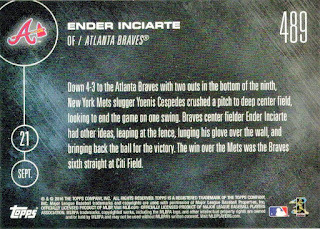 So far however I believe Ender has been the consisent bright spot of that deal. Braves fans are used to seeing fast guys patrolling center field, whether it was at Fulton County Stadium, Turner Field or now SunTrust Park. Ender has joined the ranks of some great Braves centerfielders and hasn't disappointed. He was the club's lone All-Star reprensentative at the 2017 festitivities held in Miami this year...and the guy deserved it. He has some great speed and is oh so fun to watch in the field. I don't know how he covers so much ground. 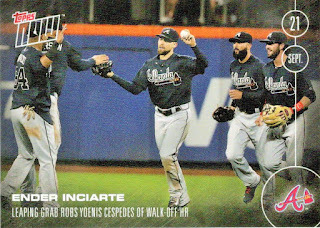 In July my wife and I had front row seats in centerfield, pretty much right behind Inciarte. Watching him in person cover the outfield was so cool. He's not all about his defensive abilities though, he can get on base with his speed and he's been known to steal a base or two as well. 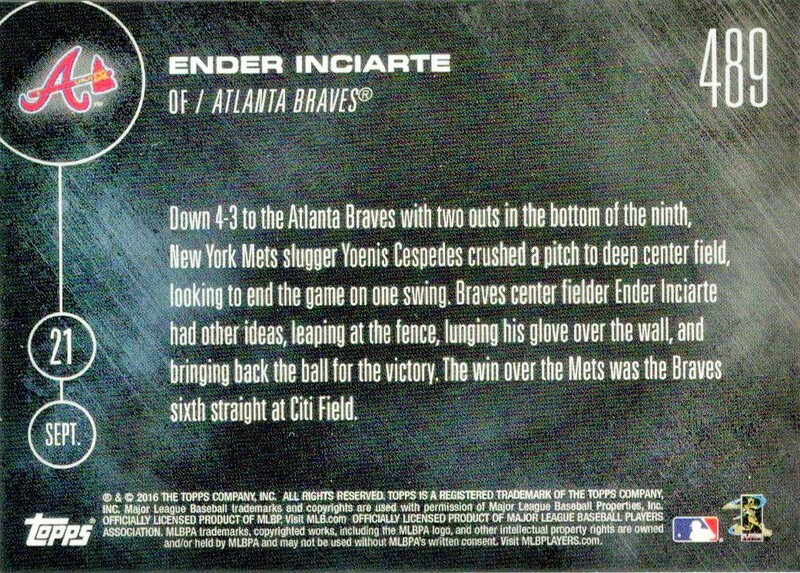 For this particular Topps Now card it spotlights a game saving catch where he robs the Mets' Yoenis Cespedes of a HR. I'm pretty sure when it's all said and done, this will go down as one of the Top 10 lopsided trades in MLB history. You are probably right...even the Diamondbacks organization knew it as they fired their GM shortly after.